The Wisconsin-based newcomers from Product Of Hate chose their band name for a good reason! The five-piece honed their brutal and groovy thrash sound / NWOAHM by sharing the stage with Lamb Of God, Meshuggah, Gwar and Testament to name a few. The band is pumped and ready to introduce the world to their debut album "Buried in Violence." 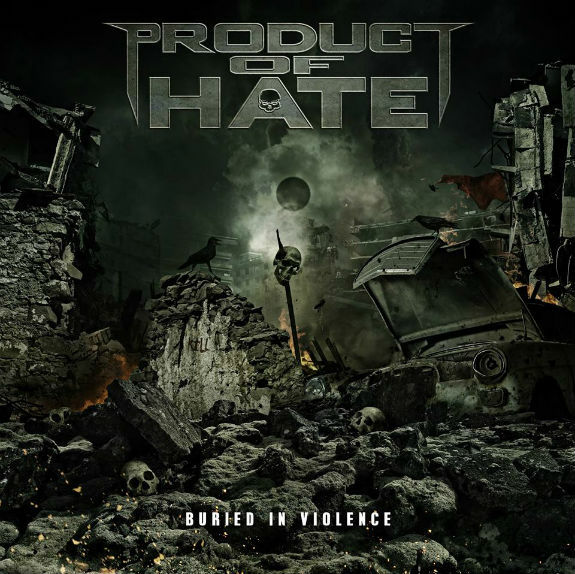 Product Of Hate just confirmed a February 5, 2016 release date for this debut album via Napalm Records. The brutal artwork was designed by Colin Marks of Rain Song Design, while the album was mixed and mastered by James Murphy of SafeHouse Production. "When you see the album art, right away you know what to expect. Dark, brutal, and unforgiving... The artwork was designed around the lyrics from our song, 'Buried in Violence.' It became the title track," says vocalist Adam Gilley. Napalm Records A&R Representative Demetri Benoist added: "We are really looking forward to the release of Product Of Hate's debut album Buried in Violence! These guys are going to take the metal world by storm in 2016!" Diviner Posts "Come Into My Glory"
0 Comments on "Product Of Hate Reveals New Album Details"